More than 700,000 microscopic fibres could be released into wastewater during each use of a domestic washing machine, with many of them likely to pass through sewage treatment and into the environment, according to new research. A study by the University of Plymouth examined the mass, abundance and size of fibres present in waste effluent following washes of synthetic fabrics at standard temperatures of 30˚C and 40˚C. It found hundreds of thousands of tiny synthetic particles could be released in each wash, confirming earlier work at the University of Plymouth that the washing of clothes is a major source of microscopic fibres within the aquatic environment. The research found that laundering an average washing load of 6kg could release an estimated 137,951 fibres from polyester-cotton blend fabric, 496,030 fibres from polyester and 728,789 from acrylic. The polyester-cotton blend was consistently found to shed fewer fibres than both the other fabric types, regardless of the differing treatments, however, the addition of bio-detergents or conditioners tended to release more fibres. 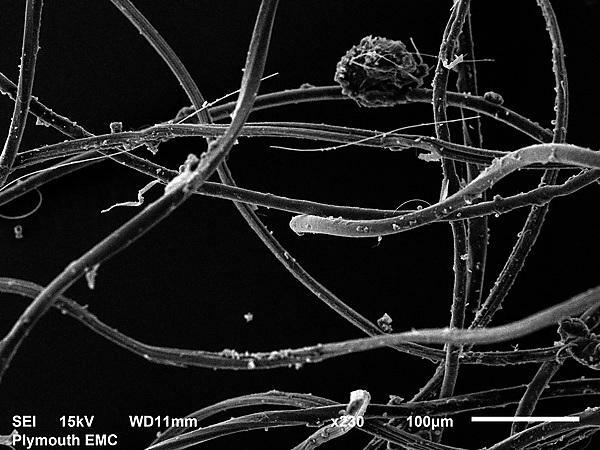 The full study – Release of Synthetic Microplastic Plastic Fibres From Domestic Washing Machines: Effects of Fabric Type and Washing Conditions by Napper and Thompson – will be published in Marine Pollution Bulletin, doi: 10.1016/j.marpolbul.2016.09.025. A full copy of the research paper can be sent in advance of the embargo lifting. International marine litter research draws on a rich and varied resource of researchers.